The following article will show you how to make a paracord keychain. The benefit of making items out of paracord is that you can use the cord for many tasks. Paracord is amazing when you are in need of survival supplies. From fishing to flossing your teeth, from replacing shoelaces to making shelter, paracord adds quite a bit to your survival gear. 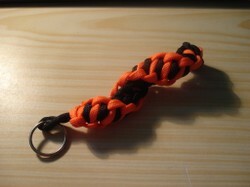 This page will focus on the paracord keychain, it will teach you how to make these keychains. Enjoy and please comment if the page offered you useful information! Paracord is actually shortened name for parachute cord. The cord is used by different professions and people, but it was intended to be a durable cord for parachutes. As such it is deigned to hold an impressive amount of weight (550 pounds, which translates to about 250 kg). The cord was popularized by paracord bracelets, which introduced the element of practicality and esthetics. Because it is not a big burden weight wise and is easy to use (light and does not get in the way) the paracord bracelets promoted the cord as a crafting supply. That meant that paracord became an alternative to other materials. Being useful, easy to craft with and having nice contrast makes paracord crafting a variety of knotting (and to some extent, braiding). Paracord crafting has a vivid and active community which posts new ideas for projects regularly on channels like Youtube, Pinterest as well as various blogs. For more on paracord, especially specifications, try wikipedia. For a gallery of paracord projects, try this paracord creations page. Now lets get to the job at hand! Let's make a paracord keychain! All images on the site were made by me. Read this segment to understand how to make the keychain. It will make your job a lot easier. The wrapture keychain seems intimidating for a beginner. So much complexity, from the spiral shape to alternating colors on it, it seems like a challenge! Thankfully the challenge is not that great. If you ever made a bracelet using a square knot, cobra stitch (cobra knot), then you will have an easy time making this keychain. Now how is it made? The concept behind this keychain is to simply alternate square knots on one side to make a spiral. An even better description for this keychain would be a double spiral keychain. In any case, alternating cords will produce the two color effect, making the knots using the spiral knot will produce the spiral effect. It may seem hard, but i have provided a step by step image tutorial and also found a video on Youtube that will help you make this keychain. Enjoy the tutorial, comment on your progress.